That is until I finally got my skin balanced and under control with the correct products and consistent home regimen. I also stopped picking at my skin. GAME CHANGER. Needless to say, my skin will purge a few tiny breakouts a year but now I've mastered the art of popping a pimple without actually popping it. First things first, never touch the pimple or your face unless it's with clean hands and absolutely necessary. I repeat, DO NOT TOUCH YOUR FACE! Always wash your hands before you touch your face. You will only spread the bacteria causing more breakouts and can damage the skin leaving dark/red spots. If you can manage that, you're more than half way there. Once the pimple has arrived, double cleanse your face, pat on Biologique Recherche P50 all over and spot treat with END-ZIT. 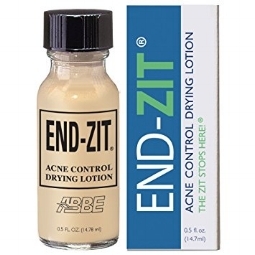 This powerful little treatment is not only concealing the blemish but also working on getting rid of it immediately. Use twice a day before make up.